Here’s a feel good story for Dementia Awareness Month Day 11! Perhaps we all need a day of of dementia, especially for a gorgeous Koala story about love. “It’s no surprise a baby wouldn’t want to let go of his mama while she underwent emergency surgery. It’s probably rare that hospital staff would let the baby cling to her during the procedure. 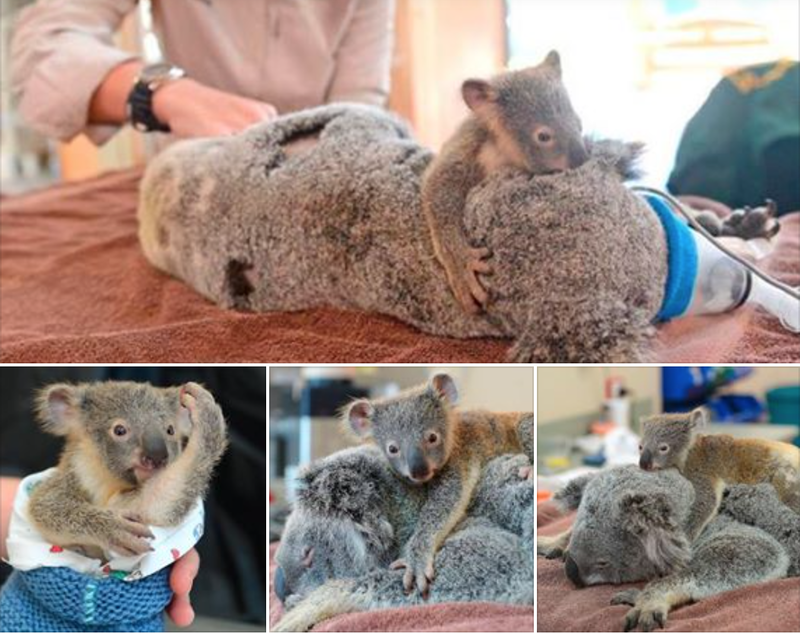 That’s what staff at the Australia Zoo Wildlife Hospital did when Phantom, a six-month-old koala joey, wouldn’t let go of his mother during her recent operation for a collapsed lung, according to The Courier-Mail. After being hit by a car on a highway west of Brisbane, Phantom and his mother, Lizzy, were taken to the animal hospital in Beerwah, Queensland. While Phantom wasn’t injured, Lizzy suffered a collapsed lung. Follow the link in the title to read the full story. Images below is a screen shot taken from the same website. Wonderful. We all have so much to learn from animals and pets.